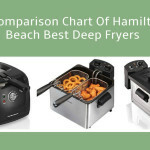 The Hamilton Beach 35034 Professional-Style Deep Fryer is one of the largest fryers that you find in the market. The large capacity of the fryer is attributed to its purpose for professional use. 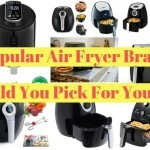 The fryer allows you to fry crisps and other mouthwatering foods without the fear of facing a mess. 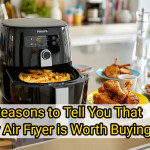 Other than the generous space that the fryer offers, you get to enjoy convenience when frying through the temperature control system and the timers that come with the fryer. The fryer also comes with a double basket that allows you to cook different foods at the same time. 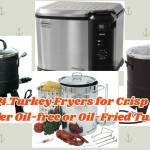 Hamilton Beach 35034 Deep Fryer has the following features that make it one of the best fryers. The adjustable timer comes with an audible tone. The audible tone alerts the user when the time that was set has elapsed. With the timer, the fryer provides the user with the necessary control to manage the frying process. The fryer can be programmed to meet the needs of the particular food that is fried and alert the user when the fried food is ready. This way, anyone can simply cook a fabulous meal without much trouble. One of the key features of the Hamilton Beach 35034 Deep Fryer is its simplicity in use and clean. Firstly, it is easy to assemble. The parts of the fryer are easy to put together because they directly attach to each other. 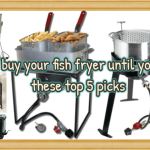 You do not need any special equipment or tool to set up the fryer. The simplicity of the fryer and the insulation of the electric parts make it easy to clean. The design allows easy access to all parts of the fryer making it easy to clean. 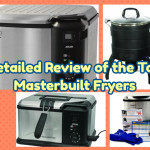 The timer, temperature control, and the alert system make the fryer easy to use. 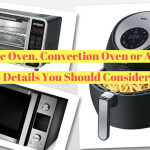 You simply know the right temperature and time for the food that you are frying. The larger capacity fryer area can accommodate two baskets at the same time. The fryer baskets can separate the two foods completely but have them submerged in the same cooking oil. The design allows you to cook different foods at the same time without having them mixed up together. This aspect makes the fryer very functional especially in a professional way. It also makes the fryer economical because two foods can be fried at the same time saving electricity and the frying oil. One of the main features of the Hamilton Beach 35034 Deep Fryer is its windowed lid. The lid has a window that allows you to view the frying process without opening the lid. This enhances safety and keeps the frying clean by preventing spillage. The hot oil does not get its way to your skin and burn you. On the other hand, your kitchen remains clean due to the preventive lid. 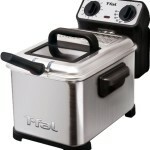 The breakaway cord makes the handling of the fryer convenient. You can detach the cord and reattach it when you need to use it. The heating element of the fryer gets immersed into the cooking oil. This design makes the frying process faster. The immersion system also ensures that the heating of the oil is uniform across all areas within the fryer. This helps in ensuring that the cooked food is prepared professionally and uniformly fried. Making a perfect meal is much easier with the fryer doing the heat control and distribution. The immersion heating element also plays a critical role when cooking different foods at the same time. 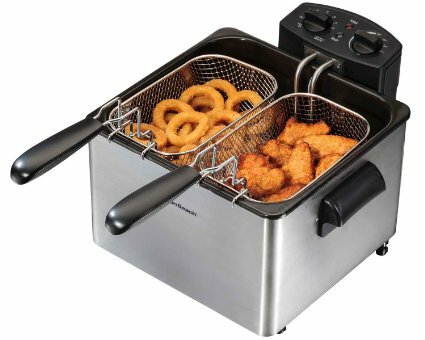 The Hamilton Beach 35034 Deep Fryer comes with three baskets. 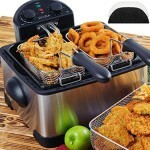 In addition to the fact that you can fry two meals at the same time with the two baskets, the fryer comes with three baskets of different sizes for different foods. The power cord magnetically attaches to the fryer and can be removed. This feature enhances the safety of the fryer when cooking. The lid manages the grease splatter to the lowest level possible. The timer of the fryer turns the fryer off automatically when the set time is right. It is too larger making storage a challenge for people with small kitchens. The Hamilton Beach 35034 Deep Fryer requires a lot of oil. Its large size requires a lot of oil to reach the frying level. The lid is not attached to the body of the fryer. You will need to find a place to put the lid when opening the fryer. 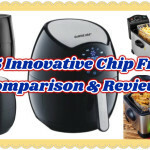 The Hamilton Beach 35034 Deep Fryer does not have a filter. 1. What is the wattage of the fryer? 2. What is the voltage 110V or 220V using? 3. What’s the lowest and highest temperature setting? The lowest is 140 degrees, the highest is 375 degrees. The instructions say fill frier with about 15 cups (3.5L) but no more than 19 cups (4.5L) of oil. 5. How many pieces of chicken can fry in this unit at one time? About 6-8 pieces of chicken, it’s depends on the size of the pieces. The fryer offers what most people need in a fryer. 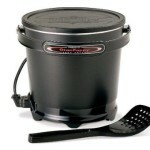 It offers the large capacity to cook more than one food. It is easy to clean. It is convenient to use. The fryer also has an additional value in its control mechanism and the fact that it is made from materials that last long. 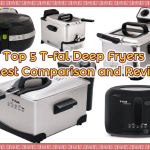 These attributes despite the few limitations makes it an ideal fryer for professional use.